Condeixa-A-Nova is located in central Portugal. The town of Condeixa A Nova, also referred to as Condeixa, is located in central Portugal south of Porto and about 25km from the coast. 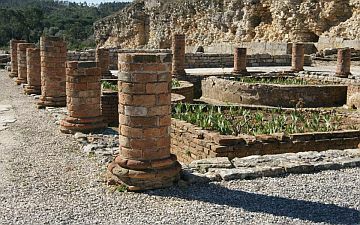 Dating back to 9BC it is probably best known for the Roman settlement of Conimbriga which, although it was not the largest Roman town in Portugal, is now one of Europe’s best preserved Roman sites. By the time the Romans arrived in 2BC it was a flourishing village, and under their rule it soon became a very prosperous town with an Amphitheatre that could accommodate over ten thousand visitors. However, by the 3rd century the Roman Empire was beginning to crumble and Conimbriga soon became vulnerable to a number of barbaric attacks with the Sueves eventually capturing it in 468AD. Incredibly, only 10% of site has been uncovered in the last decade but excavations have revealed the foundations of several houses and public buildings. In two of the houses you can see the stunning workmanship that went into the original mosaic floors. They have also uncovered the remains of several bathhouses with networks of stone heating ducts, a number of working fountains, a section of Roman wall, and parts of the forum. Only a short drive from Condeixa is the city of Conimba which dates back to the 13th century. Up until the 1900’s Conimba had the only University in Portugal. The University sits high above the old town and inside is a beautiful Baroque library with an exceptional collection of very rare books. If you are interested in Romanesque architecture you should visit the Se Velha Cathedral, the final resting place of several Bishops. There is also a convent which was build during the 17th century, Convento de Santa Clara-a-Nova, which houses the silver tomb of the town’s patron saint, Queen Isabella. If you have children with you Conimba has some great beaches nearby along the Mondego River. Otherwise you can head for the seaside to Figueira da Foz which has several other amusements to keep them entertained such as a Skart Track, an Aquapark, and a Skygarden where they can go climbing. For those who prefer fresh water swimming just down the road from Figueira da Foz is the town of Ereira which has a popular lake. Northeast of Figueira da Foz is the Dolmen of Carnicosas which was declared a National Monument. This is one of the best preserved Neolithic burial grounds along the Serra da Alhadas. However, for those who are more interested in outdoor pursuits, this whole area has a great deal to offer with everything from hunting and horseback riding to mountain biking and rafting on the Mondego River. You can even take a boat out and do some sea fishing. So there is something for every member of the family to enjoy. 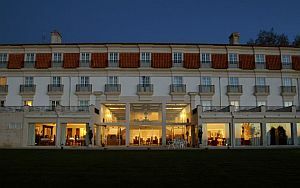 Should you decide to explore this part of Portugal there is no better place to base yourself than the Pousada de Condeixa A Nova (Hotel Santa Cristina) in Condeixa. It is a four star hotel offering excellent accommodation, has its own restaurant serving local and regional dishes, and is located in a very tranquil setting. It is a wonderful place to come back to at the end of a very full and active day.